or post it there by yourself. In this case please give me a call ahead - Tel. +49 981-87617. Costs are calculated according to time and effort. A working hour costs 49,50 Euro. and damages in transport to the cabinet and the glas scale are eliminated. If you need spare parts just contact me. within its specifications should not be automatically replaced with one from new production. New produced tubes often do not have a long lifetime. Tefifon can continue to be used. A copy according to your sample can be molded from plastic material. Currently the colors brown, white and ivory are available. Silicone rubber is poured into a machined form together with the metal parts of the driving wheel inserted. The finished wheels have proven to work in practice. 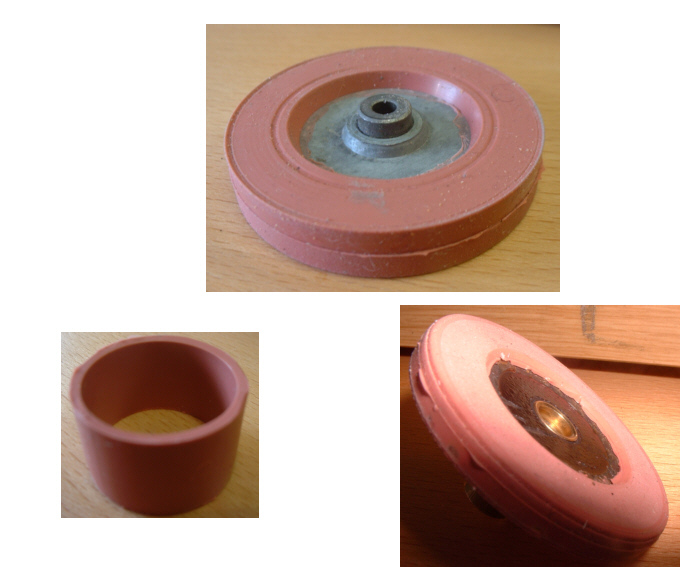 Here you see: KC1 Driving wheel, KC1 Guide roller, Dual 1010: Picture.